Creative Lighting Ideas to Brighten Up Your Wedding Venue! Summer’s long gone, the monsoons have ended and winter is fast approaching. This only goes to say that the dark, cold nights are well on their way. And if you have a wedding coming up, you best plan out the perfect way to light up that drab winter mood and add a nice warm touch to your big day! What’s more is lighting plays a vital role in setting the mood for your wedding so choosing the perfect way to brighten up your wedding venue is kind of important. Plus, creative lighting ideas definitely amp your wedding decor by a couple of notches. So to help you out with all the brilliant ways to achieve a gorgeous, glam wedding atmosphere that is also warm and cosy, we’ve made a list of some unique and unusual lighting décor ideas that we came across and simply loved. Check them out, they’re quite impressive! Who would’ve thought something as simple as light bulbs could make wedding décor look so pretty? We also love this décor idea for how easy to incorporate it is. String your wedding venue with a couple of paper lanterns fitted with string lights or bulbs. You could also opt for colourful bulbs inside white paper lanterns for a colourful yet muted atmosphere. This goes both ways! Colour paper lanterns with white lights work just as well. Drape your wedding venue with some overhead string/bistro lights hung in aesthetic and creative ways for a romantic, makeshift ceiling. Another way to incorporate lights is to place them in or around a ball made of rope, twine or cord. The best part is they’re totally DIY! To make the ball, all you need to do is wrap the rope/twine/cord tightly around a balloon in random patterns and cover it with a layer of glue. Make the sure the glue is mixed with a portion of water to make it easier to slather on. Let the ball dry overnight. Once, it’s dry, pop the balloon with a pin and voila! Your very own twine ball. Now all you need to do is place any kind of light inside them and hang them up. Mason jars are so DIY too! Pick out all the old jam jars and nutella jars from your cupboard and use them to add a creative touch your wedding lighting and décor. 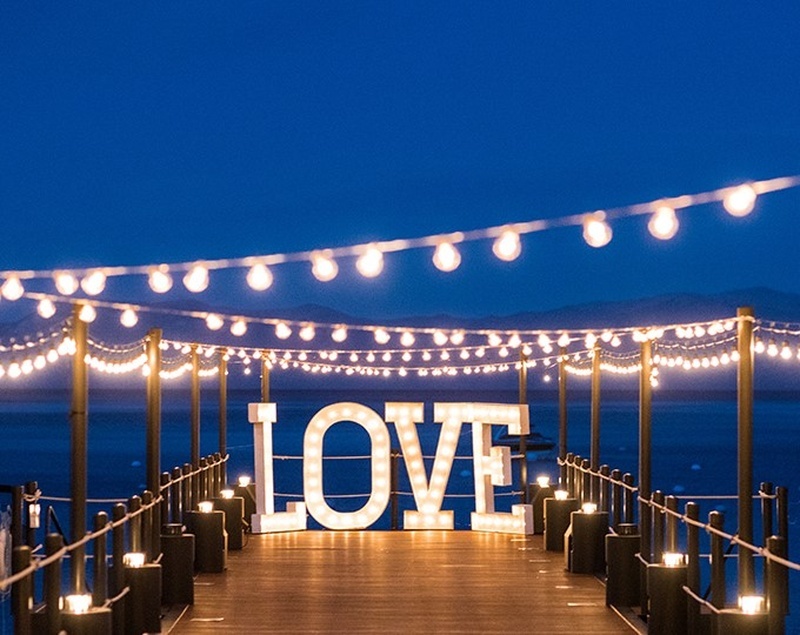 These lit up sign boards glam up your wedding ambience quite a bit. They are fun to have around and also serve as a great background for your wedding photos! Way to make a day memorable! Release them into the sky once the night ends and they are sure to set a memorable concluding note to your wedding day. Using over-turned tea and saucer sets as wedding lighting certainly add a whimsical atmosphere to the venue. A simple way to do this is to use plastic/paper cups and plates, glue them together and drill a hole in between through which you could fit in your light. These work brilliantly for a cute and romantic touch! Also, they are super simple and will take you next to no time. Gather all those empty wine bottles from your bachelorette and use them to make some economical and unusual light decorations! We loved this one! So simple yet so creative. Not to mention, easy to incorporate. Experiment with colours and patterns of the umbrellas and also the lights. You could also try turning the umbrellas upside down!